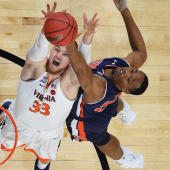 The first of three highly anticipated federal trials tied to the FBI's investigation into nefarious recruiting tactics in college basketball began in earnest Tuesday in downtown Manhattan. It didn't take long for the trial to make headlines and send up flares around the sport. Casey Donnelly -- attorney for defendant James Gatto, who is a former high-ranking Adidas executive who's been charged with two counts of wire fraud and conspiracy to commit wire fraud -- said in her opening statement that Gatto's orchestration of a $100,000 payment to send five-star prospect Brian Bowen to Louisville was a way to "level the playing field," according to reporters on the scene at the courthouse. In October of 2017, after Bowen's illicit commitment to Louisville became known due to the federal probe, longtime Cardinals coach Rick Pitino was fired. On Tuesday, Gatto's legal team brought a new school into scope and did so with a bombshell accusation. Oregon has now been roped into this story in a significant way. Oregon officials put an initial short statement in the hours after the start of the trial. On Thursday, an even longer and more detailed statement in response to Donnelly's claim was published. It denies any wrongdoing on behalf of Oregon and states there was a brief internal investigation of its men's basketball staff. A claim was made in federal court this week that the University of Oregon offered money to a prospective student-athlete in men's basketball. The UO takes this claim very seriously. We have reached out to the U.S. Attorney's Office in the case to ascertain whether any evidence exists to substantiate this claim. They have not yet responded to our inquiry. To date, the UO has never been contacted by federal authorities or any other parties involved in this or any other current criminal or civil case related to recruiting in men's college basketball. Last year, in response to allegations of fraudulent recruiting practices within college basketball, the UO conducted interviews with members of the men's basketball staff and reviewed player recruiting practices. That review found no evidence that the UO had used monetary offerings to prospective student-athletes or their family members to entice them to attend the UO. After the claim was made in federal court this week, we again spoke with members of the men's basketball coaching staff and, again, found no evidence that illicit conduct occurred. Based on all of the information currently available, we feel confident that coach Dana Altman and members of his staff uphold the highest standards of integrity in recruiting. Coach Altman is one of the nation's most respected men's basketball coaches, and we are proud of his strong track record of success on and off the court. We will continue to closely monitor proceedings from the U.S. District Court in the Southern District of New York. The University of Oregon, famously one of the most prosperous Nike schools in college athletics, was not the only program put forth by the defense in its opening remarks. The defense said on Tuesday that Under Armour put up $20,000 to push former elite recruit Silvio De Sousa to Maryland, while Arizona was involved to the amount of $150,000 to land Nassir Little, a projected 2019 lottery pick who's expected to star for North Carolina this season. De Sousa is at Kansas; his eligibility for the upcoming season remains uncertain. Gatto's attorneys are aiming to show college basketball's recruiting ground as dirty -- potentially necessarily dirty -- at the high-major level. They're also seeking to establish a clear difference between breaking the NCAA rulebook and violating the law. The prosecution is alleging Gatto, his Adidas associate Merl Code and a basketball runner/middleman Christian Dawkins coordinated illegal benefits to high school prospects and/or their families and representatives. In doing so, the Department of Justice alleges the universities were defrauded. Because money was conspired to be delivered across state lines, the crimes are federal in nature. With hundreds of hours of federal wiretaps at their disposal, some of which could be used as evidence in this trial, the prosecution is prepared to show the defendants as willing rule-breakers out to play the schools against themselves, even if unwittingly in some cases. With wiretap -- and even video -- evidence, Gatto's defense team is not pushing back on what did or did not happen. Witnesses in the case will be called in the coming days, including Brian Bowen Sr., the father of Louisville's former prized recruit. (Bowen could not earn eligibility at the college level in the wake of the investigation. He's currently playing professionally for a team in Australia.) Bowen's father made a deal, which gives him immunity from being prosecuted. His testimony will be among the most anticipated in this trial, which is expected to last 3-4 weeks.